I have started this thread to document my experience in solving the annoying steering wobble that afflicts many Patrols in the 80km/h – 110km/h speed range (Sometimes referred to as the Death Wobble on the Aussie forums). The thread is the result of my personal experience, and also draws from information gleaned from other forums. I`m hoping this will consolidate the information into one location that will be a valuable resource to others trying to solve this problem on their own vehicle. If you have any further information to add, please contribute to this topic. My Trol has had the infamous wobble since I bought it in June 2008, but as every other Trol I test drove (about 8 in total) had the same issue, I was not overly concerned. It has however taken me until quite recently to get to the bottom of the problem, so I hope this post will short-cut the process for the rest of you! 1. Wheel Balancing: This is one of the easiest and cheapest causes to eliminate, and just involves a trip to your local wheel alignment shop. 2. Wheel Bearings: The next step is to jack up the front of the vehicle so that both wheels are off the ground and feel for play in the front bearings. This is best done by trying to rock the wheel in the vertical plain, and feel for play. If there is any play, you need to remove the auto hubs and adjust the pre-load on the bearings. Don`t over-do it, or you may damage the bearing. On a bearing that’s already bedded in, the pre-load ring can just be turned lightly (usually just a fraction of a turn) until you feel that the play is gone. I found some play on the drivers side front wheel on my Trol, but sorted this out some time ago, and unfortunately didn`t photograph the process. It’s a fairly strait-forward procedure however, and a cursory glance at the workshop manual (diagram below) will soon set you on the right track. 3. 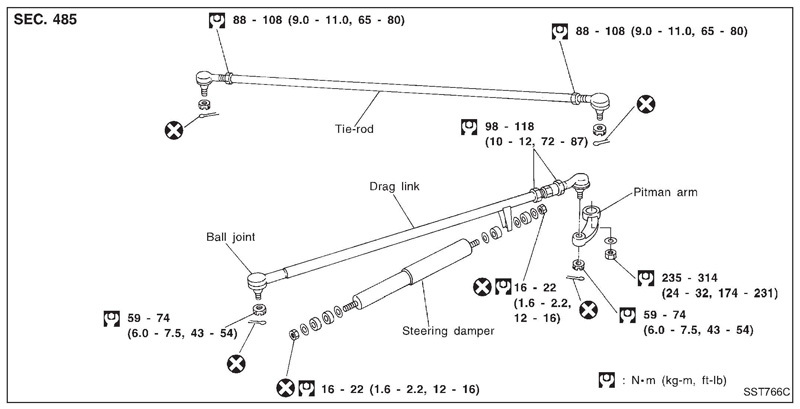 Drag Link and/or Tie Rod end ball joints: Having checked wheel balancing and Wheel Bearing pre-load, the next thing to do is crawl underneath and check the steering component ball joints for play. 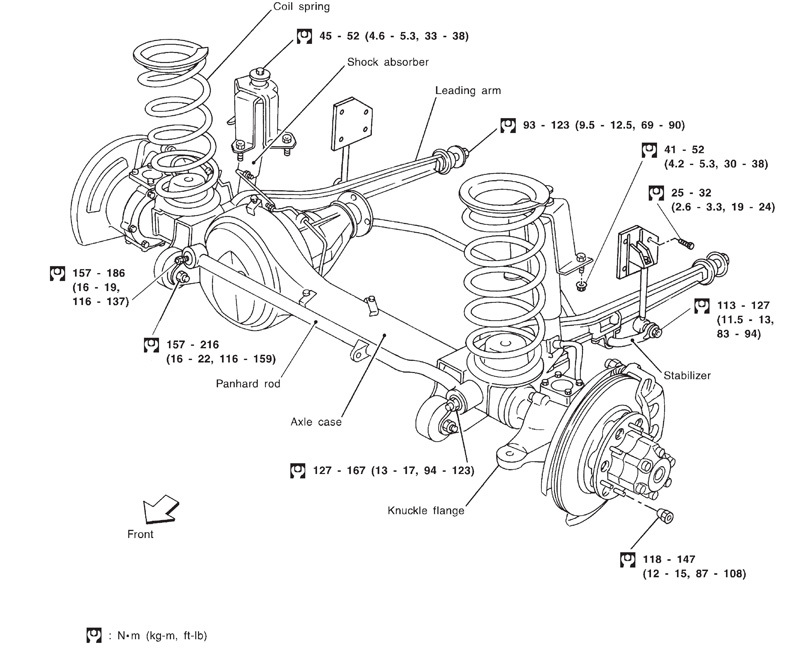 The Drag Link runs roughly parallel to the front axle (in front of the axle) and connects the pitman arm (which is the arm on the bottom of the steering box) (drivers side) to the front passenger side wheel. 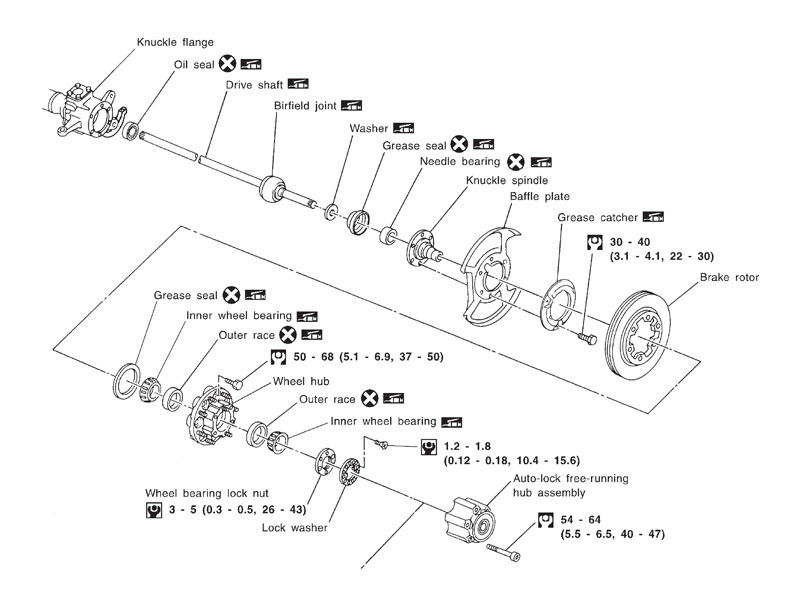 The “Tie Rod” runs parallel to the front axle (to the rear of the axle), and connects to the hub of left and right front wheels. There are ball joints at each end of both the “Tie Rod” and “Drag Link” and any play in these will be amplified through the steering. The best way to check for play is to try and move the rod in a vertical (i.e up & down) direction. If any play is evident the ball joints are worn out, and require replacement. The other way to check for play is to get SWAMBO to swing the steeling wheel from left to right while you watch the joints for free play (ie movement in the joint without moving the wheels). GU “tie rod ends” are mercifully available from the Aftermarket retailers. The PartQuip part number for GU Patrol tie rod ends is TR05677 (I paid roughly R400 for a set from Midas, which is less than a fifth of the price that your local Nissan Stealer will rush you for!). Just make sure you get a set which contains both a left & right hand thread, as the first set I was given contained two rights! Replacement of the tie rod ends is fairly strait forward. A ball joint extractor is preferable, but a 10 pound hammer, a good deal of determination and as a last resort some heat will also do the job. To keep the alignment approximately right, count the number of exposed threads on each side before replacing the rod ends, and then screw the new ends to approximately the same point. Remember that this just keeps the wheels pointing in “approximately” the right direction, so make sure you get the wheel alignment professionally adjusted as soon as possible. Replacement of the Draglink and Tie Rod ball joints led to a slight improvement in my wobble, but the problem still persisted. 4. Panhard Rod Bushes: Over time the wobble was becomming worse, and after reading on the Aussie forums, it became clear that worn Panhard Rod bushes is another common cause of the death wobble. To check for play, get someone to turn the steering wheel left and right while you watch the bushes for movement. There should be no movement in the bushes whatsoever, but on my lower (passenger side bush) I had significant movement….the “smoking gun”? After my initial trip to a local Nissan dealer, I was informed that they do not sell panhard rod bushes separately, and that an entire new Panhard Rod would have to be purchased at a cost of around R3 600.00. Eish! I have a copy of the Nissan “FAST” parts system, and a check of this also revealed no listed part number for the Panhard Rod bushes. I then came across a thread on our sister forum in Aus where a number of people had had a similar experience with the dealer, but then had subsequently tracked down the part numbers (believe they are the same as for a GQ) and armed with these, were able to purchase the bushes from Nissan. I was sceptical as to whether this would work here in SA, but armed with the part numbers below, I headed back to Nissan. BINGO…three days, and R600 later I had the parts! According to my information these parts work for GQ patrols, and GU Patrols up until some point in 2000. After that the more recent trolls have a slightly different top bush (more like a ball joint), however the lower bush remains the same. Replacement of the bushes is fairly strait forward. To get the Panhard Rod off the vehicle, first unbolt the steering damper, and then remove the passenger side of the Drag Link (the panhard cannot clear its mounting bolt on the passenger side if you do not do this). To remove the old bushes I used the vehicles bottle jack with a No22 socket. If you climb under your vehicle, you`ll find that the nice guys at Nissan conveniently manufactured two holes in the gearbox cross member that are the perfect size for the panhard to be held against while you jack out the old bushes (goes to show…not only a boer can “maak n plan”). I pressed in the new bushes using the same procedure, and a small amount of sunlight soap to lubricate them so that they pushed in easier. The whole process took less than two hours to complete. Once the refit was complete I headed strait for a wheel balance, just to make sure that was still okay. Then onto the highway for a test drive……YEEEEEHAAAA!!!! No more death wobble… ..my driving experience is transformed, and the Trol feels brand new again! I solved my issue without getting to numbers 5 & 6 on my list (Play in King Pin Bearings & Warped front brake disks)…so I`ll leave it to others who have experienced those issues to elaborate. Hope this shared experience will be useful to some of you! Sure as hell some very useful information - and an excellent !! Thank you for sharing with us. I am sure you have solved many headaches for a lot of forum guys - some of us is experiencing something similar like what you described here. I have noticed it on my vehicle as well - but to a very very slight degree - and have always written it off to the fact that I now have bigger tyres and maybe the balacing & alignment is not so 100%. Remember I also had to have caster corrections done on the car after the fitment of the bigger wheels - and now lately also started to experience a very very slight pulling to the left. It is noticeable but not annoying - and I have been assured that it won't do anything to the tyres. May that also mean that things are only starting to go wrong?? Hi Ross , an excellent post , certainly one of the best. Thanks for sharing all your investigations with us , much appreciated. If you remember I had the same problem, I got mine sorted out through wheel balancing, alignment and tighten and regreasing of wheel bearings. I will definately replace my tie rod ends and Pan hard bushes in the new year.I still feel a slight wobble some times. Once again congrats on this post, 10/10 . Oyi yoyi yoyi yoi ... Sorry Gents - I've missed this one. Then I had all the shackle bushes replaced [long story on that one] but the nylon bushes at Part Man was R77.00 for the eight pieces. Than I had the bearings replaced [was not necc - but the idiot mekki threw out the existing ones and stuck in new ones .. it only really needed tightening] - as described above. AND then I fitted a steering damper .. could not find one so a Gas Shock [Monroe] that had the right "eyes" on both ends were fitted..
And ever since, Lobo has never done that "death shimmy" with me since - not at any speed, even on a piece of tar "daar bo in Botswana"
the biggest improvement,. and final fix was the steering damper, I would say. Excellent posting Ross - thank you for this! Sjoe maar nou is ek moeg gelees. Goeie nag lekker slaap.